Mayville, New York is an attractive little town on Chautauqua Lake in upstate New York, just north of Chautauqua itself, famous for concerts and cultural events. The Pennsylvania Railroad's Chautauqua Branch ran from Oil City, Pennsylvania through Corry, Clymer and Mayville and on to a junction with the Nickel Plate Road at Brockton. At Brockton the Pennsylvania used rails jointly owned with the Nickel Plate Road and served as a major route for coal heading to the steel mills at Lackawanna west of Buffalo. By this time the rails were coated with rust and the line was apparently out of service. 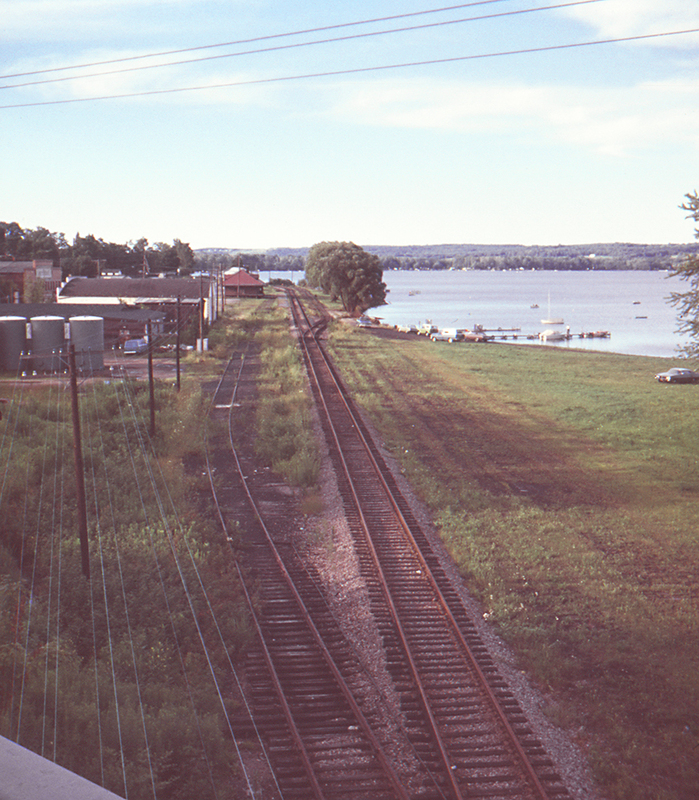 This view from the New York Highway 394 bridge looks east; the Mayville station is visible just before the line curves to the left (north) to follow the lake shore. Today the bridge and tracks are gone, but the station remains as the Mayville Depot Museum. This stretch of track has a long and complex history. In 1864 the Cross Cut Railroad was incorporated to build north from Corry to the New York state line (roughly where Clymer is located) and the Buffalo & Oil Creek Cross Cut Railroad was formed to build from Brocton (where it connected with a precursor of the Lake Shore & Michigan Southern) south to the state line; both roads were built under the wing of the pre-Vanderbilt New York Central. In 1867 the two roads were consolidated as the Buffalo, Corry & Pittsburg, only to be renamed again in 1879 to the Buffalo, Chautauqua Lake & Pittsburg Railway. In 1880 it was merged into the Pittsburg, Titusville & Buffalo. At about this time it decided to build its own line to Buffalo, and since the Nickel Plate Road was also building along the lake shore (paralling the New York Central) the two roads shared a double-track line from Brocton to Buffalo. In 1889 it became part of the Western New York & Pennsylvania, after which their were no further changes of ownership until finally taken over by the Pennsylvania in 1900. For the entire convoluted story readers are encouraged to find a copy of The History of the Western New York & Pennsylvania and its predecessors and successors by Paul V. Pietrak, Joseph G. Streamer and James A. van Brocklin (Hamburg, N.Y., 2000). This page posted 11/1/2017. Text and photo ©2017 Lamont Downs.